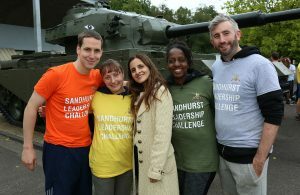 THREE plucky Woking Borough Council staff and Cllr Mark Pengelly took part in a gruelling leadership challenge day held at the Royal Military Academy Sandhurst (RMAS). The event was run by the Army’s 11 Infantry Brigade and the South East Reserves’ and Cadets’ Association for 60 employees from a wide range of private and public sector businesses in the South East of England. Cllr Pengelly, Angella Kentaro, a Senior Housing Options Officer, Matt Cobb, a Senior Licensing Officer, and Livia Kallayova, an Assistant Events Manager at the HG Wells Conference & Events Centre joined the other participants in six teams that were instructed in key military leadership techniques and were then pitted against each other and tested on a variety of exciting and thought-provoking scenarios. The range of tasks were specifically designed to challenge the participants mentally and physically; encouraging team building, the development of leadership, communications skills, initiative, lateral thinking and problem solving. Summarising the day’s events, Lieutenant Colonel Graeme MacPherson, of 11 Infantry Brigade, said: “The teams were faced with a range of physical and mental challenges which exposed them to unique and challenging circumstances. The different scenarios allowed the participants to reflect on leadership and team building skills learned during the day and hopefully they will be able to apply these in their work environment. Woking Councillor, Cllr Ayesha Azad, attended as an observer. The Leader of Woking Borough Council, Cllr John Kingsbury, said: “The Council has strong and well-established links with the Armed Forces anchored by a Covenant, signed in 2012, which outlines the moral obligation between the nation, the government and the armed forces.